This report, "Challenges to the Network: Internet for Development", is the second report in the Challenges to the Network series. This updated version of the report has been prepared specially for TELECOM '99, held in Geneva 10-17 October 1999, and contains the very latest data for Internet host computers. 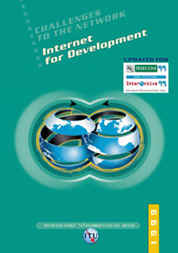 The subject this year is the role of the Internet in economic and social development, with a focus on developing nations. Individual chapters look at the use of the Internet for commerce, for health and for education. Other chapters look at the impact of the Internet on the public telecommunication operators of developing countries, and on the challenges facing regulators. The report provides some 170 pages of analysis, complete with data tables and charts. A Statistical Annex to the report presents the latest available data (for January 1999) on Internet penetration throughout the world, as well as time-series data on Internet development such as number of Internet hosts, hosts density, Internet access tariffs, estimated number of users in major economies, etc. The report also provides data on the status of the public telephone network, PC penetration, ISDN and data communications. Report online - electronic version (in PDF Format, viewer available) 100 CHF Order Now !